Photo courtesy of Lea Bartos. Our fire and brimstone range is to die for. Best fabrics include glossy satan and blue demon. Finally! I’ve found the place so many people have told me to go to! People try to put us down, just becase our fabrics get around. Best example of Copy & Paste going wrong. The road to Hell is paved with good intentions and the best fabrics. Go to Heaven for the climate, Hell for the fabrics. Official fabrics used by the Hell’s Angels. The road to Hell is paved with repetition. It appears that hell has exploded, scattering sentence fragments everywhere. The road to hell leads to my front door. Signed: ex-husband. It appears that Hell has a long standing tradition, of incomprehensible Engrish. The road to Hell is paved with the finest fabrics. This makes me happy to know that grammar nazis don’t go to hell. @JI. I thought that would have been a “Grammar Nazi’s” Hell. 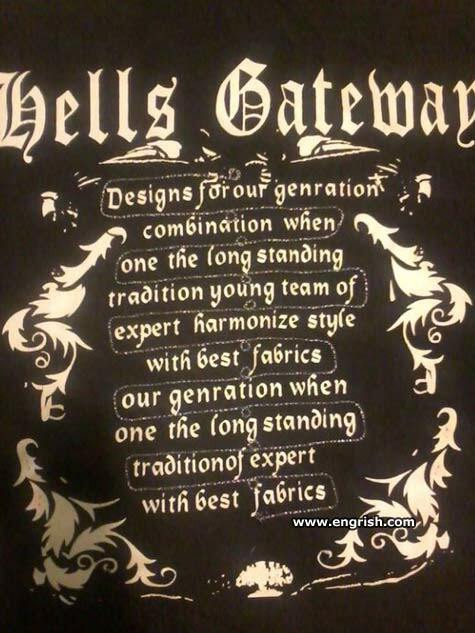 Hells gateway harmonize your genration. The designer of this shirt went on to start one about a banana. He still hasn’t finished spelling it. Gateway’s tech support used to be great, until Faust Enterprises bought them out and instituted this new mission statement. Good Gracious – What Gibberish!